Activa Contracts has become the first major contract hire and leasing firm to partner with Nationwide Mobile Repairs as it looks to open up the benefits of mobile repair to its clients and help ensure vehicle damage is fixed prior to defleeting. 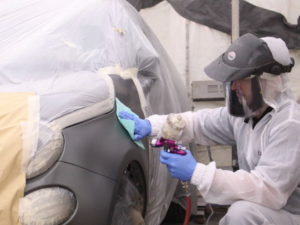 Part of Nationwide Accident Repair Services, Nationwide Mobile Repairs runs an 80-strong fleet of mobile repair units across England, Scotland and Wales, providing a comprehensive accident repair solution said to match the standards of a conventional bodyshop. All repairs are completed within a single day at a location of the fleet decision-maker or driver’s choice – saving time and the inconvenience of taking a company car or van into a traditional bodyshop for repair. Work is completed within a fully enclosed repair capsule, giving technicians the capability to repair most vehicles, including some commercial vehicles such as medium-wheel based, low-roof vans. Repairs are said to be affordable compared to traditional bodyshop prices and Nationwide Mobile Repairs offers a lifetime guarantee on all repair work. Lisa Temperton, Activa Contracts’ sales and marketing director, said the service could see customers benefit from reduced costs as well as downtime. “The quality of the damage repairs by Nationwide Mobile Repairs is first class,” she explained. “Some of our customers have previously used smart repair firms for bumps and scratches and the work undertaken has not been of the required standard in accordance with our end-of-contract damage policy. Activa Contracts’ customers will also be able to use an updated mobile phone application, which allows drivers to send pictures of any damage they would like to be repaired and have direct contact with both Activa Contracts and Nationwide Mobile Repairs to advise on the best course of action. “Having vehicles off-the-road is costly and business in-efficient so the new Nationwide Mobile Repairs’ service we are offering will be extremely beneficial to customers,” Temperton added.